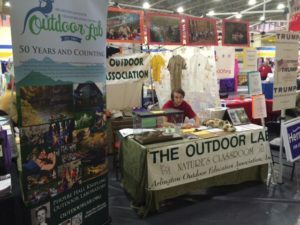 Arlington Outdoor Lab staff and AOEA Board members will be at the Arlington County Fair this year. Drop by and pick up coloring/activity sheets or leave us a note about your favorite memory of the Outdoor Lab. T-shirts will be be available for $10 & $15 – enter our free raffle and win a t-shirt – one winner a day will be chosen. For more info, check out the Arlington County Fair Website.